The Armenian group of 83 specialists have left for Syria. What are your thoughts on this fact? Are concerns that such a mission in Syria under the Armenian flag may endanger our interests substantial? Firstly, there is anxiety about the security of our military rather than the reaction of the United States or the European countries. Will our military become target of terrorists, are there threats to our military? This is a priority that we must consider, once such a decision is made. The second concern appeared because there are a lot of questions that have not been answered. 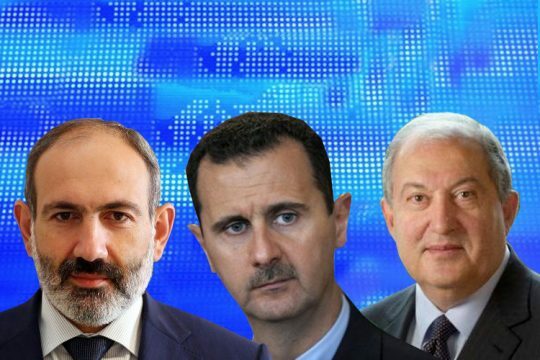 In particular, what is the exact term for which the specialists of the Ministry of Defense have been seconded to Syria, is this contingent of 83 final or will the number increase, will there be rotation, what will the period of rotation be? In brief, there are questions which have not been answered, and this complicates things because if there had been more transparency, the causes of concern would have been fewer. I think the government has what to think on. As to external actors, the United States which has its interests in Syria wouldn’t welcome this decision. You know that Donald Trump has stated to withdraw American troops from Syria but this does not mean that the United States will not serve its interests in Syria. These interests will be served through other ways, other methods. This is a different aspect. You also know that the United States expressed its position when the secretary of the Security Council stated months ago that Armenia welcomes Russia’s actions in Syria, I think this was the stage when this question was discussed, and after these statements the U.S. Department of State responded toughly. Now we still have no official answer from the Department of State about its attitude to the fact. I think the United States has not welcomed this. Let’s wait for new developments to understand the reaction of the international community. Earlier Armen Ashotyan announced that a contingent has been sent to Syria without an international agreement, thus the law was broken. Is there a violation of law? As a lawyer, I can say it is not correct to go deep into the legal matters because there may be different legal interpretations of the law, the international agreements and the UN Security Council resolutions. This is going to shape a long debate on legal matters. I suggest not mixing the legal aspect with the political aspect and discussing the issue from the point of view of international law and national legislation because whatever decision was made, there would also be such reactions. From the political point of view, it is said that no rational argument has been brought why a humanitarian mission is sent to Syria. There is an opinion that this is dictated by Russia? To what extent is the Russian factor present here? I don’t think this is Russia’s will. I am sure that this is the initiative of the Armenian government. The Armenian government is fully responsible for this decision. And why is there no transparency as to the terms and conditions of the mission? Our government is the addressee of this question because the more transparent this process is, the fewer questions it brings up, the more space for objective analysis of whether Armenia needs such presence or not, rather than criticism. Maybe Armenia should have sent a bigger contingent to Syria, maybe Armenia should have increased the peacekeeping mission in Afghanistan to keep the balance? In other words, there are a lot of questions which are not answered due to lack of transparency.